As someone who has read thousands of books over her lifetime, I can think of two aspects of a story that make my heart flutter. First, I can get swept away and be unable to put down a book that has a driving plotline. One action leads into the next and both put the protagonist in even worse danger to the point that the reader can’t imagine anything possibly getting worse…and then it does. A couple of books come to mind here. One is The Hunt For Red October by Tom Clancy with the basic plot being a Russian submarine commander wants to defect to the free world. The format of the novel was that action occurred on three primary stages (settings)–US government, Russian government and the sub itself. Each scene flipped to a different setting and the reader knew the ultimate showdown had huge consequences. I remember reading part of the novel aloud on a long drive the length of California. (before audio books, folks) Jurassic Park by Michael Crichton was another that hooked me. Other authors who write similar compelling works are Lee Child, Michael Connelly, Camilla Lackberg, John Grisham. Recently, I read Zoo by James Patterson and Michael Ledwidge, which has been turned into a TV series. Partially because of the extremely short chapter length (1-4 pages each) but also the almost non-stop action of incidents and events that propel the protagonist forward. The second type of book that makes my heart flutter is a well-written romance that really digs into the characters. Especially stories that start out with flawed characters who think they have done something that makes them unlovable. Like The Wives of Bodie Stone by Maggie Osborne or Portraits by Stef Ann Holm–both historical novels have heroes who were in prison. Strong characterization and deep point of view go a long way to guarantee my reading pleasure. I strive for those two elements in the stories I create. In my latest release, Forged By Fire (part of the anthology, A Cowboy Celebration from Prairie Rose Publications), I created a hero, Berg, who thought an event that happened in his past made him undesirable and therefore, he shies away from people. One simple act of kindness makes Ivey, the cook of the boarding house, to look at him in a different way. Forged By Fire is just one of four historical stories included in Prairie Rose anthologies set in a Texas town. Double your chances of winning by signing up for the inaugural Fall issue of my quarterly newsletter. Then visit others who are participating in this blog hop. Because of personal reasons outside my control (3-week evacuation due to forest fire), I wasn’t able to properly announce the release of this Fourth of July anthology to which I contributed a story. 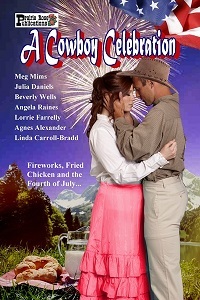 From Prairie Rose Publications, A Cowboy Celebration released late in June and is available in ebook and print. I’m so pleased to be included in this anthology of seven holiday stories written by great western romance authors. My story is titled Forged By Fire and features a blacksmith and a boarding house cook. Yes, I know what the anthology is titled but as soon as I started thinking about hot summer in central Texas, I pictured a blacksmith slaving away at his forge. And then he hears lovely notes sung by a beauty (get the beauty and the beast theme? ), and I just had to write Berg’s story. My contribution to the recipes that accompanied each story is a recipe for Buttermilk Crispy Chicken. Yummy!